We have been talking constantly about how we are going to make this dream happen, and what steps we need to take. I have been reading so much, and am completely fascinated reading Zero To Cruising from the beginning, and this new blog I found last night called This Rat Sailed looks to be a great one as well. All of the people, and many more have made this happen. It is clearly a very involved process that requires total commitment. We are committed too, and I’m really looking forward to meeting these people I’m following in the future. We went to look at campers yesterday. I’m not sure that we will move into one, but a key part of making this dream happen is cutting our expenses down now. We need to save for the things we’ll need to pull the trigger. We found a couple of campers that were nice, but nothing really felt like we would be comfortable. Still going to keep looking, but we’re also considering renting out our current home that is way bigger than we need, and buying a duplex. Rent one side and we can live in the other? Ultimately, it’s that passive income that we’re trying to figure out how to generate. I’ve always worked a salaried job – that won’t be happening anymore once we are on the water. Looks like ZTC is getting some help from LTD Sailing in Grenada, and man, that type of experience is exactly what we need. It’s going to have to wait though. Maybe there is a good sailing school on the Texas Gulf Coast? Something we could drive too would be great. 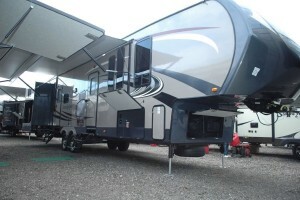 Is a 36′ fifth wheel the same size as one side of a Lagoon 380?